A Bournemouth University researcher has been awarded a prestigious fellowship to launch a health and wellbeing project for people with dementia. Dr Samuel Nyman, Senior Lecturer in Psychology, has been awarded a Career Development Fellowship by the National Institute for Health Research (NIHR). The three-year fully-funded post, starting in January 2016, provides funding for Dr Nyman and a team of colleagues to conduct a research project where Tai Chi will be taught to people with dementia in a bid to improve their health. 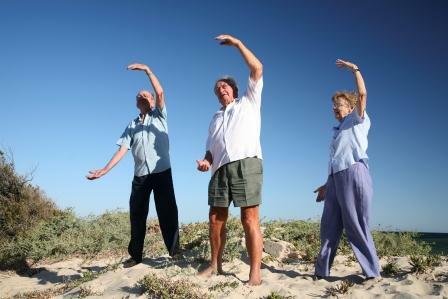 People with dementia and their carers in Bournemouth and Southampton will be offered Tai Chi to see if it leads to improvements in health and wellbeing including balance and reducing the risk of falls. Dr Nyman said, “I am delighted to have been awarded this fellowship. It will give me three years to concentrate on this exciting project that we hope will bring real benefit to people with dementia and their carers. It will also allow me to learn a lot from experienced colleagues so I can do more of this type of work when the fellowship comes to an end”. Dr Nyman will be working alongside a team based at Bournemouth University, the Peninsula Clinical Trials Unit at Plymouth University, and the University of Southampton, to conduct the project, which has been called the TACIT trial: TAi ChI for people with demenTia. The team will be supported by Elemental Tai Chi to deliver the Tai Chi classes and three NHS Foundation Trusts for inviting people into the study: Southern Health, Dorset HealthCare University, and The Royal Bournemouth and Christchurch Hospitals. Two PhD students (one funded by the Faculty of Science and Technology, BU) will be working on the project. As well as a research project, Dr Nyman will be funded to undertake a training and development programme over the three years. This will mainly entail the completion of an MSc in Clinical Trials and secondments to three UK universities with expertise in conducting similar clinical trials.